This entry was posted in Canada, DFO, Environment, Fisheries and Oceans Canada and tagged C-38, C-45, changes, consultation, Fisheries Act, habitat, legistlation by unmuzsci. Bookmark the permalink. Nice to see you’re back! I was getting worried. This is in response to your correspondence of February 21 and March 17, 2013, addressed to the Right Honourable Stephen Harper, Prime Minister, concerning Fisheries and Oceans Canada’s (DFO’s) science publications. 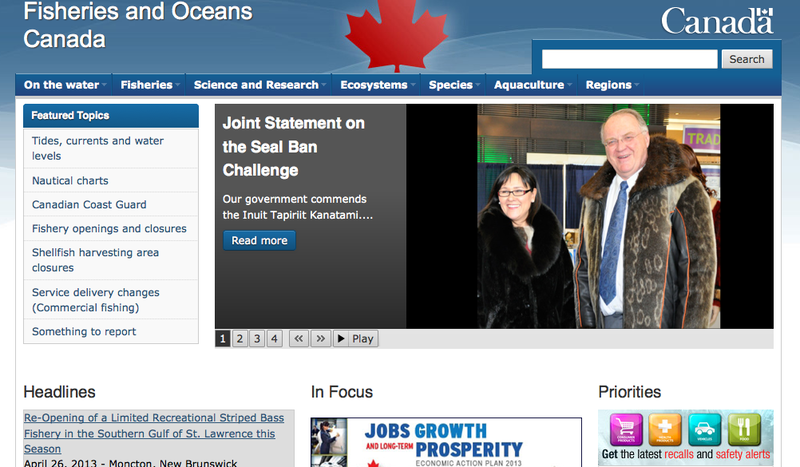 You provided me with a copy of your email for my consideration as Minister of Fisheries and Oceans. First, let me be perfectly clear – there has been no directions to any DFO officials not to publish findings of their work. DFO is a science-based department. Publishing and communicating scientific work is a crucial element of what the Department does. DFO’s record is solid on this matter. 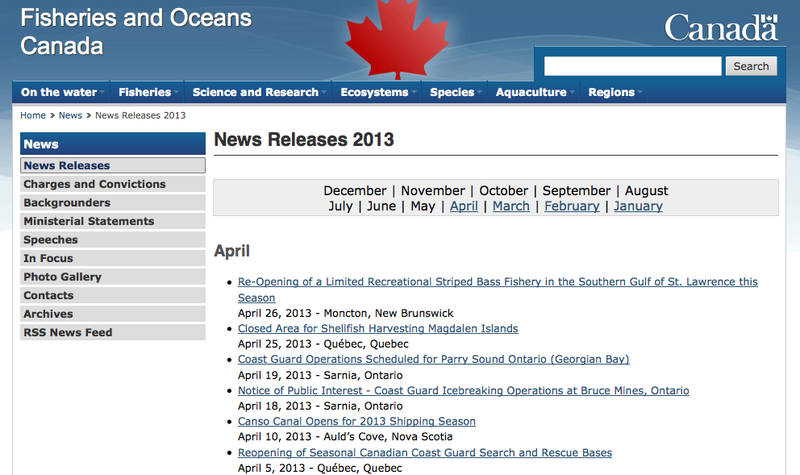 The Department publishes over 300 reports each year documenting the Government of Canada’s science research on Canada’s fisheries and oceans, and DFO’s scientists contribute as author or co-author, an even greater number of articles to books and scientific journals. Indeed, the Department’s objective is to get good peer reviewed science information into the public domain. The requirements for approval of the release of science articles are long standing and take place within DFO’s Science Sector typically by other senior scientists. This has not changed. One of the Department’s operating regions recently made minor modifications to its publication procedures. These modifications are meant to streamline the approval process, eliminate duplicative peer reviews and ensure that the Government of Canada’s intellectual property rights are safeguarded in third-party publications. In 2009, the Auditor General clearly articulated the federal government’s obligation to protect its intellectual property rights and interests, where they exist, in work producted by federal employees. DFO’s policies on the management of intellectual property and on publication of manuscripts are consistent with that obligation. 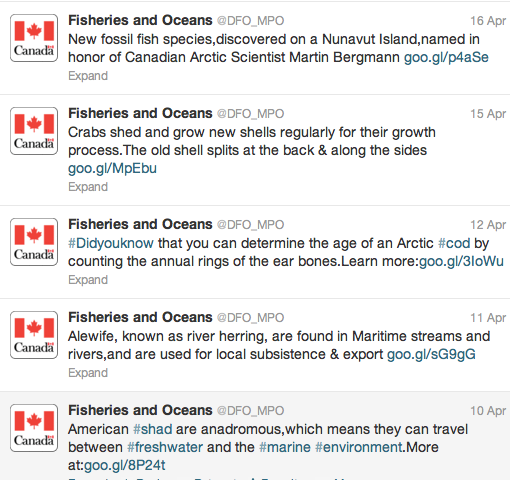 DFO scientists take the issue of scientific integrity seriously, and so does the Department. Indeed, DFO policies and procedures are designed to promote scientific integrity and ensure that DFO scientists and their collaborators are able to publish their work in scientific journals in a timely fashion. Thank you for writing about this important matter. Yes, sorry for the delay in posting- it’s been a busy month. In response to the letter you got back- that’s how our managers are selling this- that it’s an improvement over previous iterations of the publication review process, and that it’s helping the department defend it’s intellectual property. The issue as I see it is that they aren’t leaving it to the scientists to do that. Prior to this policy, if I was involved in a collaboration that led to me being co-author on a paper, then it would be my responsibility as a co-author (and representative of the department on that collaboration) to ensure that the data are used and interpreted properly; by being a co-author, I’d say credit is given where it’s due and the intellectual property and rights of the department are acknowledged. However, under the new rules, it’s not me that’s making that call- it’s a manager, who wasn’t involved in the work. My greatest concern is that it leads the door open to interference in the process by administrators- all you need is one person on a power trip who decides they are going to make your life miserable and not release the copyright on a collaborative paper (or my own, for that matter, since the new rules say that I don’t have the right to sign the copyright on behalf of the department anymore). What Minister Ashfield doesn’t seem to appreciate is that the more direct responsibility you take away from your public servants, the more hog-tied and useless we all feel. It’s like we’re all preschoolers who require constant supervision because they’re worried we’ll smear peanut butter all over the walls. It does nothing to motivate your staff when you constantly remind them that you have very little trust in them or their abilities. The way I see it, this is the next step in a long slippery slope that will further restrict DFO researchers from publishing their scientific findings. The “minor modification” to present policy, as suggested by Minister Ashfield, will have long-lasting negative consequences for DFO researchers and their ability to collaborate. Secondly, it will not be long before permission to publish is moved up the long chain of DFO command. The first step is to make the managers that scientists report to directly responsible, but we can expect that soon this requirement will be passed up the line to regional directors, directors, assistant deputy ministers and so on. This is exactly what has happened for permission to attend conferences by DFO researchers (see earlier blog). This is certainly a first step to control the message – one can only wonder what the next “minor modification” will be? So, if we are Arthur Dent and DFO is the local planning office, the logical extension, of course, is that Stephen Harper as Prostetnic Vogon Jeltz, who is in the process of destroying the earth to make way for his intergalactic highway of bitumen pipelines. Bill C-38 and C-45 are his revolting poetry.